PT Bank BNI Syariah - BNI Syariah is a directly-owned subsidiary company of PT Bank Negara Indonesia (Persero) Tbk (BNI Group) that is involved in sharia banking industry. Its business include commercial business, consumer and retail business, micro business, treasury and international business. As today, BNI Group - thr third largest state-owned banks in Indonesia - holds 99.99% shares in BNI Syariah. Other 0.1% remaining shares was owned by PT BNI Life Insurance, a reputable insurance company in Indonesia which majority owned by BNI Group. 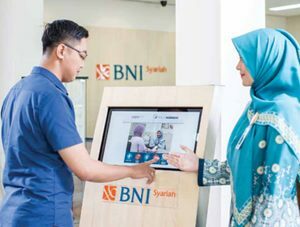 BNI Syariah is based in Jakarta and offer services through 326 outlets spread in all over Indonesia and served by 4,450 employees (as of December 2016). In term of financial performance, BNI Syariah succeeded in posting excellent financial performance in 2016. Total asset grew by 23.01% from the previous year, from Rp 23,018 billion to Rp 28,314 billion in 2015. Total income in the position of the end of 2015 showed an increase of 32.7% from Rp 229 billion in 2015 to Rp 277 billion. This figures was stated by PT Bank BNI Syariah in its Annual Report 2016 as cited by JobsCDC.com. Minimum D3 in all majors, except Nursing, Midwifery, and Medical. Single/not married (maximum age of 25 years old on February 2018). No direct family relationship currently working as an active employee of BNI Syariah KC Dinoyo. JobsCDC.com now available on android device. Download now on Google Play here. Please be aware of recruitment fraud. The entire stage of this selection process is free of charge. 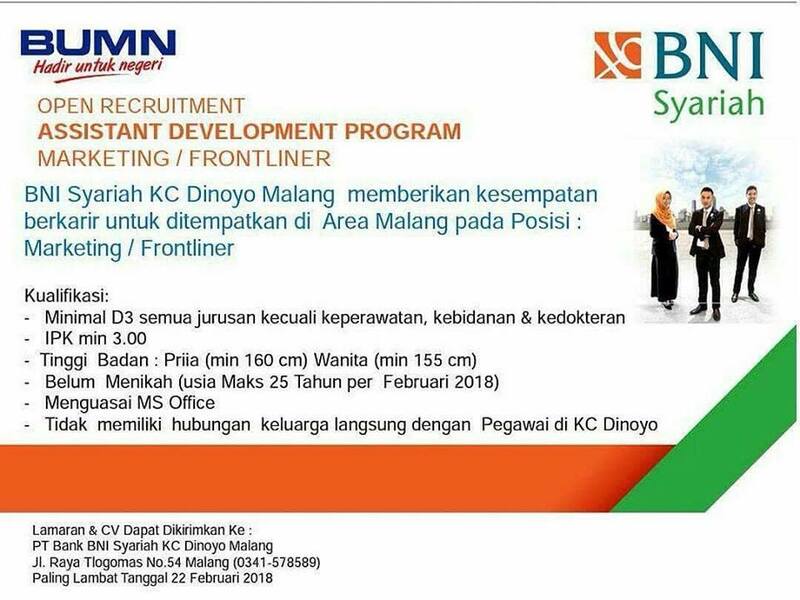 PT Bank BNI Syariah - Fresh Graduate ADP Frontliner, Marketing BNI Group February 2018 will never ask for fees or upfront payments for any purposes during the recruitment process such as transportation and accommodation.